Lieb' Doch Wen Du Willst! Photograph of a woman against a purple and black striped background. The woman wears a traditional conservative dress but wears dark eye shadow, carries a crow bar on her shoulder, and blows bubble gum, subverting standards placed upon women. 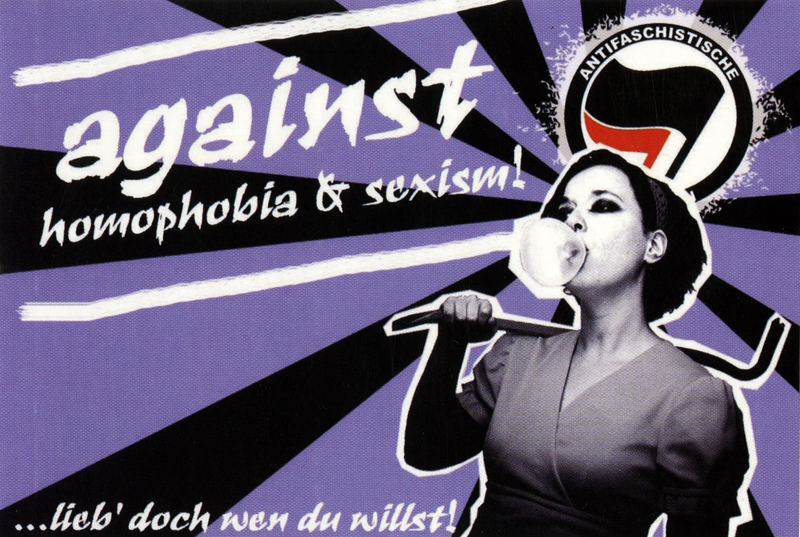 Above the woman’s head is the black and red flag logo for the German Antifaschistische Aktion, an organization whose goal is to smash fascism in all forms. Referencing the “triple oppression” theory, its members seek to eradicate sexism, racism, and classism. The juxtaposition of the crowbar and the bubble gum gives the woman a serious yet playful appearance. Furthermore, the sticker speaks to the intersectionality of feminism and LGBTQ issues.